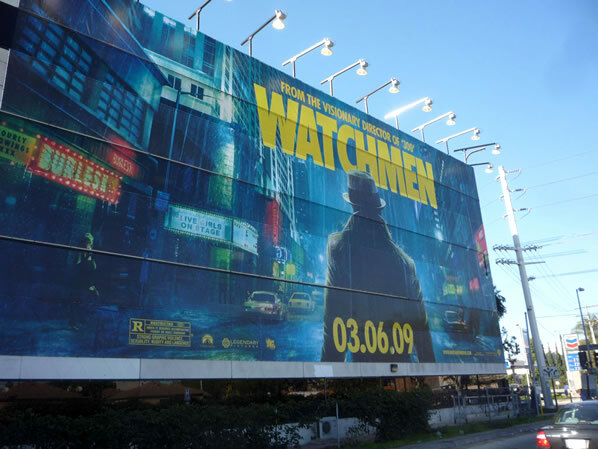 If you’ve been to a major North American city in the past few weeks I’m sure you’ve noticed your environment has become a lot more “Watchmen-y” of late. What I’m talking about, of course, is the well-saturated media campaign that WB has unleashed on the world which would even make billionaire Adrian Veidt proud. I’m not sure when it all started, but I first noticed it when I attended New York’s Comic-Con just a few weeks ago. 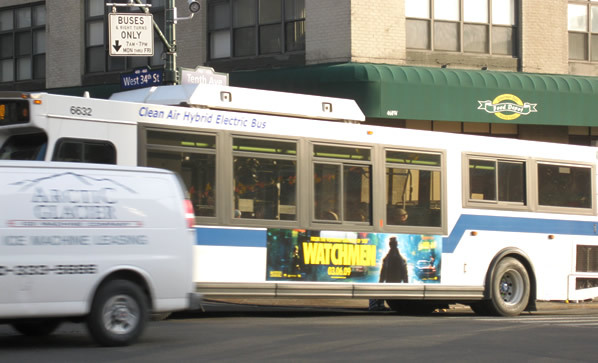 There were billboards, posters and even bus and subway advertisements everywhere I turned. 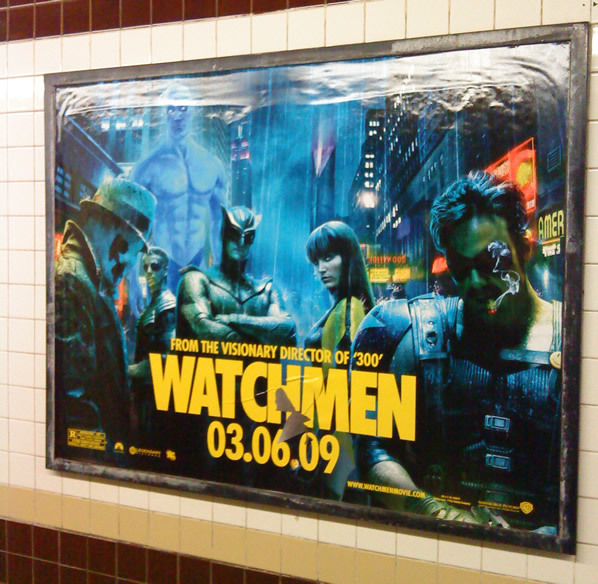 Then I head out to L.A. for the film's press junket, and — no surprise — there were ads pasted all over that city as well. Many of the ads I saw were what have been dubbed “supergraphics” — colossal building sized ads that cover office building windows and are several stories tall. In fact, these “supergraphics” are even causing some public outrage by activists who claim they are in violation of fire safety standards. But, if you think “supergraphics” are a bit over the top, what would you say to a rolling advertisement that gets about 16 miles to the gallon? 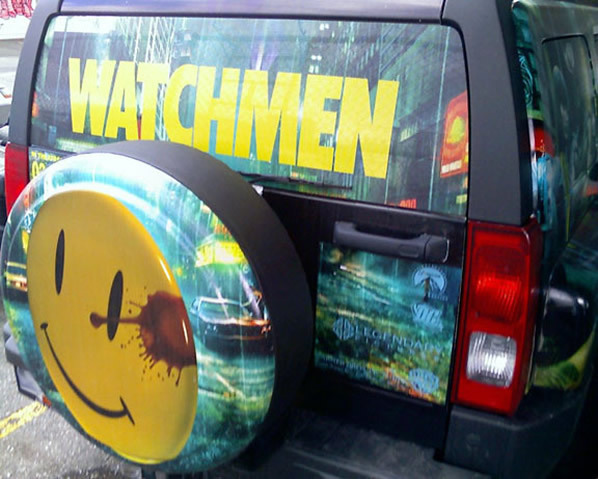 Well, one of this site’s forum members has taken some photos of a Watchmen Hummer he's seen driving around the Vancouver area, all decked out in graphics and images from the film. 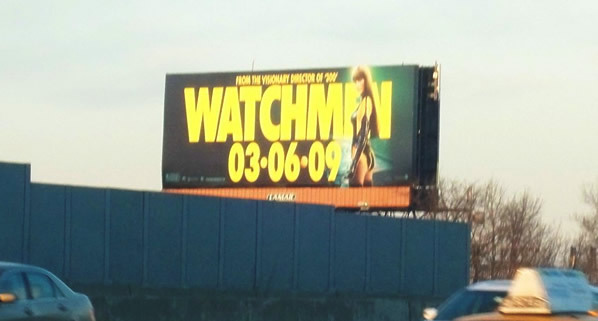 In fact, when he asked the driver what the deal was, he said WB paid him to plaster the movie’s marketing all over his gas-guzzler and even changes the graphics out from time to time to keep his ride looking fresh. What’s next? A flock of Gunga Diner elephant blimps ominously hovering over Cleveland?